The Lebanese Arabic Institute offers group classes in Lebanese Arabic throughout the year. These classes follow our comprehensive and structured curriculum, Lebanese Arabic from Scratch. Blending practical and theoretical approaches, our program is designed to help students learn spoken Lebanese while developing a solid Arabic foundation. Intensive courses are typically divided into 18 four-hour sessions or 24 three-hour sessions over a period of four or five weeks, for a total of 54 or 72 contact hours. Sessions take place 5 days per week (Monday to Friday), and are scheduled for either the morning or afternoon. We also offer evening courses, which are suitable for those who work during the day. These courses also run for four or five weeks. Sessions take place two or three days per week, two hours per session, for a total of 16 to 30 contact hours. Please note that one contact hour is defined as a 55-minute teaching session and a 5-minute break. For each contact hour, students should expect to spend at least one homework hour outside of class. Students who are not complete beginners are required to take a placement test prior to registration. This test is free and ensures that students are placed at an appropriate level. We prefer to conduct this test in person at the Institute, but for those who are not in Lebanon it can be done over Skype. Our small class sizes (typically 2-6 students per class, with a maximum of 10) ensure that each student is able to participate fully and receive plenty of personal attention. The cost of a group class depends on the total number of class hours, and is calculated at the rate of $10 per class hour per person. Thus, for example, the cost of a 72-hour course is $720. Each student is required to make payment in advance for the total cost of the course, regardless of how many class sessions they actually attend. We do not provide price reductions for any classes students may miss, whether because of illness, late arrival, early departure, or any other reason. All course materials are included at no additional charge for students registered in an intensive course. The course materials are not included in the cost of an evening course, but are provided at a discounted price ($10 for the Arabic alphabet book and $30 for each of Books 1-5) for registered students. Payment may be made at the Institute in cash (either U.S. dollars or Lebanese pounds), or via Western Union or bank transfer (US dollars only). We do not currently accept credit cards. Please note that students have not completed their registration and are not permitted to attend classes until payment has been received in full. To apply for a course, please fill in the application form below. Applications are accepted on a rolling basis, beginning approximately three months in advance of the start of the term. We recommend that you apply early, as our courses are organized in advance and in accordance with the interests of registered students. However, there is no general deadline to apply. Late registration is possible at our discretion, and subject to availability. N.B. : If you are interested in studying Arabic intensively this summer (July and/or August), please apply via our Intensive Summer Arabic 2019 page. 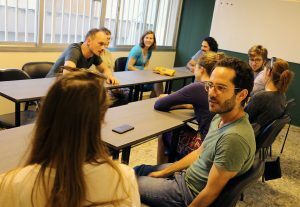 How did you hear about the Lebanese Arabic Institute?